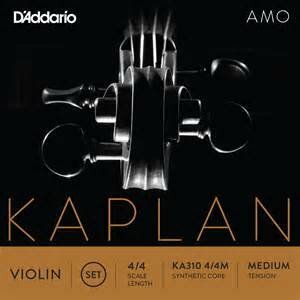 Kaplan violin strings offer professional-level players an unprecedented combination of beauty and power in two options, Kaplan Amo and Kaplan Vivo. Kaplan Amo provides warmth, richness, and flexibility for brighter instruments, while Kaplan Vivo delivers brilliance, clarity, and a robust feel for darker instruments. Both sets settle quickly, exhibiting a rich tonal color palette and superb bow response. Copyright © 2007-2019 - Amati Violin Shop, Inc.